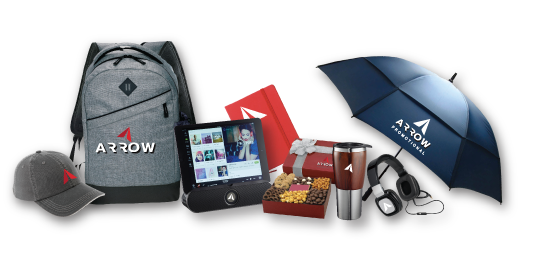 Branded Merchandise | Packaging Design | and more! 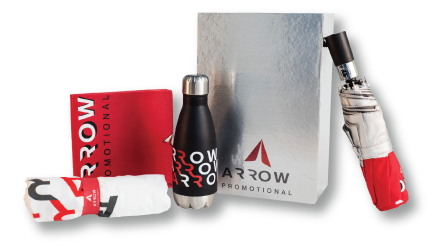 Arrow Promotional is the silver and exclusive promotional product sponsor for the Incite Brand Marketing Summit. 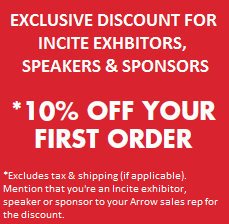 Exhibitors, speakers and sponsors just like you can round out their marketing with the most innovative and memorable giveaways, swag, and branded products for your audience. These items will be custom-made and unique just for your company or organization. Whether you’re recruiting, promoting your brand, showing appreciation to customers or employees, we can help you choose the perfect custom product to get the job done on time and on budget. We’re here to provide you with outstanding customer service, an expert design team and most importantly, a stress-free experience. We look forward to ﻿working﻿ with you!